The Beast is racing Norm Dewitt in his Zivko Edge 540 aircraft. The race begins as the plane comes in at a dive to gain speed as it crosses over the starting line at about 210 mph. The Beast is sitting at a dead stop at the starting line waiting for the aircraft to pass overhead. When this occurs, the Beast ignites its afterburners and takes off. 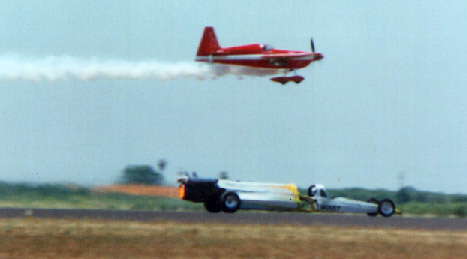 This picture was taken midway down the track where the jet dragster catches up to and then passes the plane.